Here you are, just in time for New Year's Eve!! 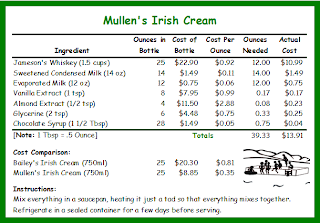 Inspired by a telephone conversation with Betty Cahalin (first cousin once removed from England), I decided to try my hand at making my own version of Bailey's Irish Cream. I started out with Betty's recipe but – as you may have guessed if you know Betty – it was a tad strong. Plus, Betty's recipe included coffee, a flavor which isn't a favorite of Marilynn's. I continued tinkering around with the recipe over the Christmas holidays, unscrupulously using my kids as guinea pigs. I'm pretty happy with the above combination. To further entice people to show up, I plan on making up a big batch of it for the Mullen Christmas Party on January 9th. Don't miss it! Marilynn and I had the privilege of being invited to a Christmas Party at Hannah Davies’ apartment in New York City on Sunday, December 27th. 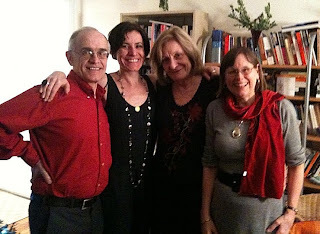 It was mostly a party for Hannah’s friends and co-workers at the United Nations, but Hannah’s parents (John and Máire) were also in town that weekend, so it gave us the perfect opportunity to meet with them as well. For a variety of reasons, Sunday was an extremely hectic day for Marilynn and I. As a result, we didn’t even get out of the house until 5pm, the official start of Hannah's party. Five minutes into our journey – just as we were getting on the New Jersey Turnpike – I realized (to my horror ) that this was the end of the Christmas weekend and that millions of New Yorkers were probably trying to get back into the city! I snapped on WCBS 880AM for “traffic and weather together” and heard the unspeakable: there were 1½ hour backups at both the Lincoln and Holland Tunnels and a 2 hour backup at the George Washington Bridge! We were already going to be one hour late – being three hours late was intolerable! What could we possibly do??? Luckily, I had the wisdom to marry an intelligent, resourceful woman. Marilynn suggested that we head to the closest train station in NJ and take a train into New York City. Brilliant!!! We headed to MetroPark in Woodbridge, NJ and arrived just in time to catch the 5:43pm train. Sure it was a slow NJ Transit train and, yes, it was a local, but we still got to Penn Station in NYC by 6:30pm. Having been warned by Hannah that there was no easy route to her apartment building by subway, we hurried to the nearest taxi stand only to find it mobbed. Rather than wait 20 minutes or more, we decided to view this as an exercise opportunity and walked the 2 miles to Hannah’s. And so it was that at 7:04pm Marilynn and I arrived fashionably late and mildly sweaty at Hannah's Christmas party. Even though I was late, I was honored by being presented with the last “Christmas cracker”. For those of you on the left side of the Atlantic, Christmas crackers are a staple of Christmas festivities in the UK and Ireland. They consist of a cardboard tube (i.e., a toilet paper tube) wrapped to look like a big piece of candy. Two people pull on the ends of the cracker and it’s supposed to make a popping (or “cracking”) noise when it splits. Usually, the cracker is filled with candy or a small gift of some kind. Mine contained a prize (a small tailor’s measuring tape), a paper crown (which I wore during the party), a riddle (“What has a bed but does not sleep and a mouth but does not speak?”), and a piece of candy of some kind that flew underneath Hannah’s couch. Despite the fact that most of the people at the party were connected with the U.N., the conversation was not dominated by politics and world events. To be sure, those topics did come up, but we also talked about sports, music, movies, books, exercise, travel, family, food, and basically everything under the sun. With so many different nationalities represented, there was never a dull moment. The food and drink was excellent and, before we knew it, it was after 10:45pm and Marilynn and I were out the door, saying goodbye to Raphael the elevator guy (who was retiring that evening!) and heading to Penn Station to catch the 11:15PM train back to MetroPark. 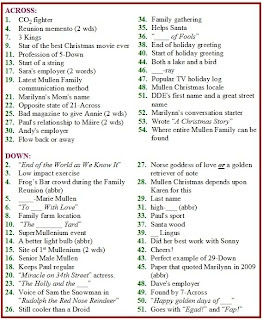 Answer to the Mullen Christmas Card Crossword Puzzle! I didn't expect to get too many completed puzzles since many of you either don't have or are not comfortable with the technology necessary to electronically submit your entry. All told there were 8 entries. Everyone did fairly well and, although there can only be one true winner, the judges have handed out multiple awards. Mary and Tom Kinslow jointly share the Most Persistant award. Their entry was emailed to the judges on December 22 with the modest title of "Victory is Ours!". They followed that up with a phone call the same day demanding to know exactly how well they had fared. When informed that they had, in fact, made a couple of unspecified errors, their Christmas cheer began to evaporate. But since it wasn't December 25 yet, the judges were forbidden to tell them the exact errors they had made. This escalated the tension and resulted in a final comment of "This puzzle is bulls**t!" followed by a click. But Mary and Tom weren't done yet. 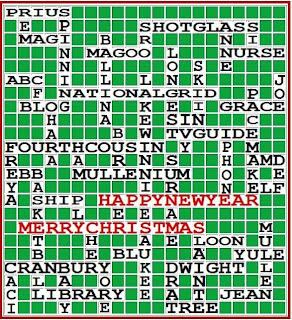 Mary followed up with a second puzzle entry on December 23 and yet one more email on December 24 entitled "We are waiting for recognition of our crossword 'mavenness'." Well, sad to say, Mary and Tom are not the Mullen Mavens. But they are damned persistant!! The second award for Most Originality goes to Annie Mullen Patrick. Truthfully, I expected Annie to completely ignore this crossword puzzle competition. Though highly educated, Annie is not at all keen on games like crossword puzzles. As a matter of fact, her game-playing days pretty much plateaued with "Steal the Pile" back in the 60's. On top of that, Annie is unquestioningly the least technologically savvy of the entire Mullen Family, and that includes Chelsea. So there was no way I expected her to complete this puzzle, take a photo of it, and email me the photo. But Annie surprised me by coming up with a totally unexpected and original way to submit her entry. On Christmas Day -- right in the middle of the festivities -- she called me on the phone and proceeded to verbally relay every single one of her answers! I kid you not. And for the many clues for which she had no answer, Annie tried her best to wheedle and/or extort the answers out of me. After about 40 minutes of this browbeating, I finally convinced her to wish me a Merry Christmas and hang up the phone. Inexplicably, the actual winner of the coveted Mullen Maven award goes to Beth Anne Kafasis, a co-worker of Marilynn's at the Cranbury Library. Somehow, Beth Anne was able to figure out the answers to uniquely Mullen clues like "Dave's Employer" (CACI) and "Bad magazine to give Annie" (TVGUIDE). Ironically, the only answer that Beth Anne got wrong (indeed, everyone got this answer wrong), was to the clue "CO2 fighter". The answer was, of course PRIUS, the car I've been driving since 2006! Almost everyone guessed TREES which, of course, is wrong since the clue is singular ("fighter") not plural ("fighters"). The great irony lies in the fact that Beth Anne drives a Prius herself! Great job Beth Anne! Thanks to all of you for playing, even if you just played at home and never emailed, texted, or telephoned your answers to me. Merry Christmas and have a great 2010! 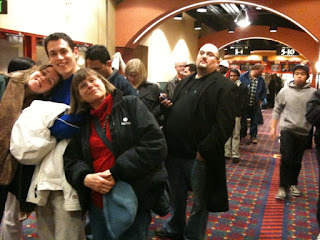 Sara, Andy and Marilynn waiting in a humungous line to watch Avatar at an IMAX theater on the evening of Christmas Day. We bought the tickets ahead of time, got to the theater 40 minutes early, and we were still behind a couple hundred people. This movie better be fantastic!! !